This Officially Licensed Indian Motorcycle Soccer Table game provides hours of entertainment for the Soccer and Indian fan of any level. The Game cabinet is laser engraved with the Indian Motorcycle Logos. The playfield is regulation size and is competition ready with built in trim. Ground, plated, and polished high Tensile Steel rods come with octagonal, sure grip handles and non-binding bumpers. Players are made of automotive grade ABS material, are counter balanced, and are attached with spiral pins, all ensuring better ball control. Game comes with grit tumbled, ground urethane ball that provides for more durability and enhance ball control. 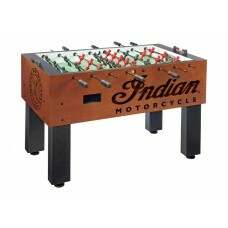 Finish your man cave with this furniture quality Indian Motorcycle Foosball table and enjoy for years to come.